This Lent we want to become who we are so everything inside and around us can be revived, the risks we take can be life worthy and we can enter to the territories which only the friends of God can occupy. We dive into prayer, spiritual reading and give ourselves to fasting to align our desires with God's will. I will find silence so I can hear Him speaking from within. I will cross from shallow silence where "I" is the center and I will trek toward the peak where I am not only silent with my lips but where my heart is resting in the silence of the Holy Spirit. Be it at night or during the day, sitting or walking, short or long, I will not give up until the Word will resound louder than any other voice. I will pray no matter how great or how dull it will feel. I will join a network of people who carry each others burdens and prepare for a renewal, first within me, and then within my family, within circles of my friends, in my church or neighberhood. I must become who God created me to be to see the revival God has promised. I will ask for help when I will want to give up, and I will try not to give up when I will fail or become weak. If I do not have one, I will create intentional space for solitude and prayer. I will establish a rhythm and practice of prayer that can last after Lent is over. I will not get discouraged when I disrupt my plan, but go back to it. Join our MajorChange for Lent'17 Fb Group for daily support, reflections, prayer, recipes and more. Everyone picks the prayer time and kind according to their personal discernment. 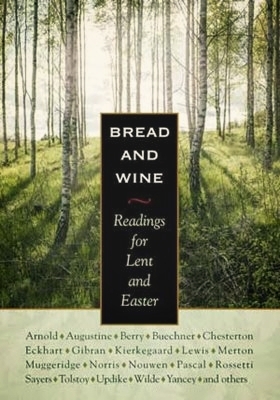 Daily devotional, poetry, reflections and articles, culled from the wealth of twenty centuries, the selections in Bread and Wine are ecumenical in scope, and represent the best classic and contemporary Christian writers. Six separate sections (Invitation, Temptation, Passion, Crucifixion, Resurrection and New Life) guide readers through the essential elements of spiritual preparation and feature writings from some of Christendom’s most celebrated masters. Classic thinkers such as Martin Luther and John Donne share space with 20th-century theologians like C.S. Lewis, G.K. Chesterton and Dorothy Day. There is also a generous sampling from contemporary writers, including Dietrich Bonhoeffer, Soren Kirkegaard, Fyodor Dostoyevsky, George MacDonald, Leo Tolstoy, N.T. Wright, Philip Yancey, G.K. Chesterton, Pascal, John Updike, Frederick Buechner, Madeleine L’Engle, Henri Nouwen and Brennan Manning. Reading schedule will be posted soon. We will start on Monday, Feb. 20th (Monday after meat-fare Sunday), and continue till after Easter. 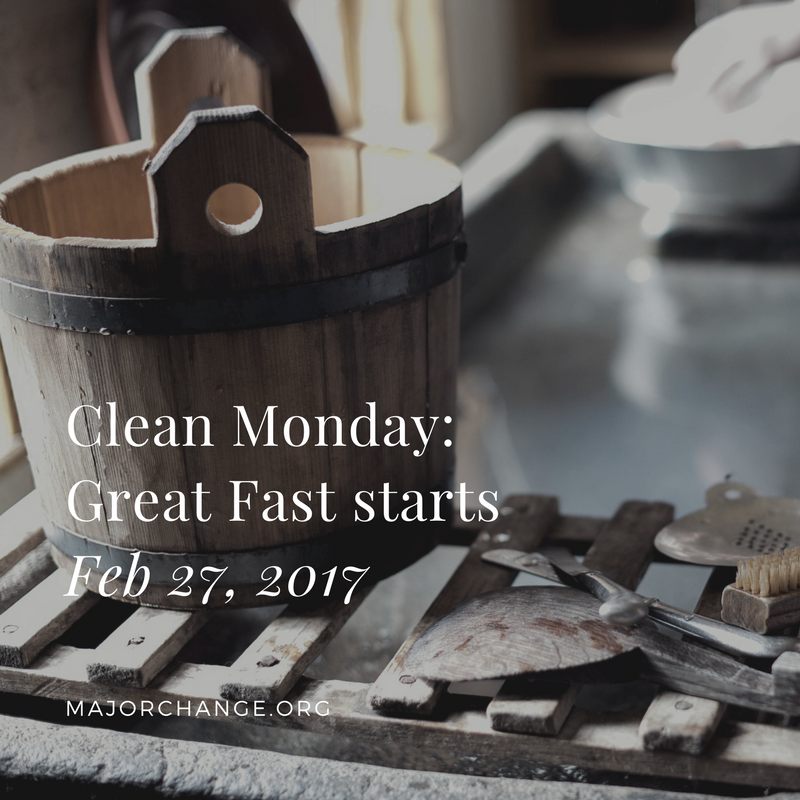 Join our MajorChange for Lent'17 Fb Group for daily support, reflections, prayer, recipes and more. You may pick your personal spiritual reading and still participate in our Lenten prayer and fasting. I will find a way to fast so I can mourn my sins, carry the cross, enter into freedom and receive all that God will send my way. As a spiritual discipline, fasting's goal is to reorient our attention, time and resources to the things that matter in the Kingdom of God. Fasting during Lent should provide enough food to satisfy the hunger and sustain the body for the glory of God. Therefore, fasting will look different for everyone. We propose Eastern Christian tradition of fasting for Lent'17, especially because Orthodox and Catholic Christians will celebrate Easter on the same day this year. Pre-Lenten season the Triodion: Feb. 12 - Feb. 26, 2017; starts on the 10th Sunday before Pascha (Easter Sunday), focuses on preparing for Great Lent. During this time, normal fasting on Wednesdays and Fridays continues. Pray to discern your kind of fast. Avoid laxity and legalism. Join our MajorChange for Lent'17 Fb Group for daily support, reflections, prayer, recipes and more. Last day to eat meat until Pascha. Meat refers to the flesh from a vertebrae and includes fish. Shellfish are permitted. You become vegetarian. Forgiveness Sunday. Last day to eat animal products: milk, eggs, butter, cheese, yogurt etc. You become vegan. Great Fast starts. No food from midnight to noon. From now on one meal is permitted each day, Monday to Friday. All the time we drink water. Wine and oil are allowed on Sat and Sun. Latin rite celebrates Ash Wednesday and Lent starts for Latin rite. Sundays of Lent. Eastern Christians continue fasting. Latin rite Christians fast voluntarily. Feast of Annunciation. Fish, oil, wine allowed. Holy Week is a separate fasting week from Great Lent for Eastern Christians. Fasting is intensified. Monday through Thursday one meal each day is taken but those who are able may fast completely. Many people eat uncooked food only. Friday and Saturday should observe complete fast. * Fasting should be done after personal discernment, consultation with spiritual director and/or a doctor, in case you have some health issues. Info about fasting in the Eastern Churches taken from Aquinas and More and links included there. Pray for the way in which you may give sacrificially during Lent. Give your time, energy or money. Give yourself to others in need.